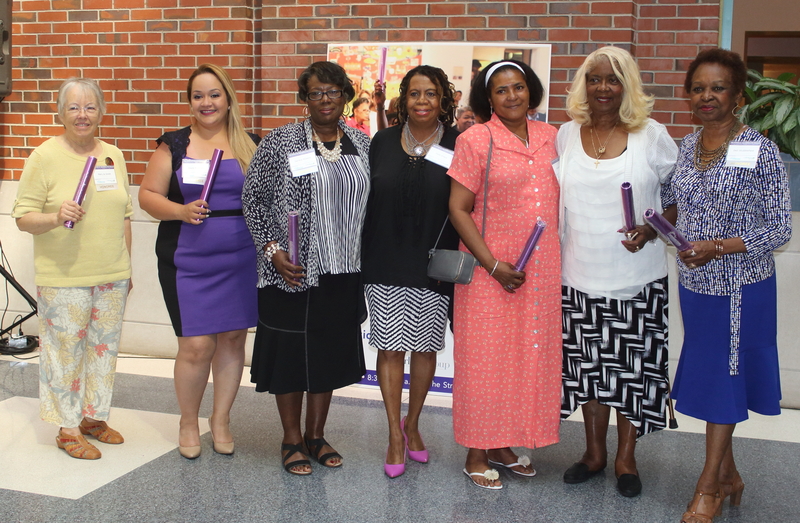 Michigan Community Resources honored six Detroit grassroots leaders Tuesday at the 3rd annual “The Power of One Dedicated Woman” awards breakfast at the Stroh River Place Atrium. Founded in 1998, MCR supports and empowers community organizations in the Michigan that serve low-income populations. The hallmark of MCR’s mission is community economic development through pro bono legal services, urban planning services, community outreach and educational training. Jill Ferrari, CEO of Michigan Community Resources, believes the annual ceremony provides a space for MCR and the community to celebrate these local sheroes for their tireless work within the community. The six women chosen for MCR’s 2017 Power of One Dedicated Woman awards are Sonia Renia Brown of Auntie Na’s House, Deysi Martinez of Living Arts, Aleasa Peatross-Smith, Sandra Pickens of Littlefield Community Association, Mary Jo Smith of University District Radio Patrol, and Dell Stubblefield of Focus: HOPE. These extraordinary women, chosen from a list of dozens of impressive nominees, have proven their commitment to their community’s by strengthening their neighborhoods economy, increasing safety, creating green and community spaces, strengthening the housing and environment of their neighborhoods, engaging their community and building strong organizations. “We’re just honored and privileged to serve these women and these organizations and we are really looking forward to the day when these stories are the norm, that these stories are being told on major media outlets and there is no gap between these women and this work and everyone that’s trying to make decisions and do good in the city of Detroit. When these women sit at decision-making tables that will drive the future of Detroit,” said the MCR CEO. During the ceremony, created by Dotti Sharp, board chair of Covenant Community Care, each nominee was given a purple baton to symbolize the importance of “Passing the Baton,” a major MCR tenet, in order to support youth as they develop into future community leaders. For more information about Michigan Community Resources or to submit a nomination, go to www.mi-community.org.